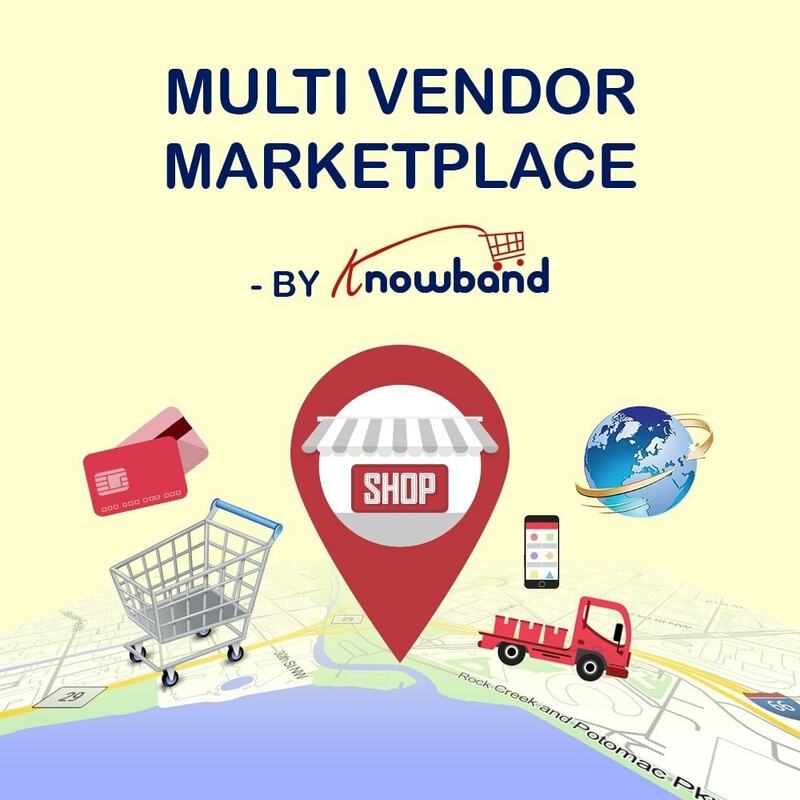 The Multi-Vendor Marketplace module is the best solution to convert your online store into a marketplace so that multiple sellers can list their products on your marketplace and in exchange you can charge a fixed percentage commission to the sellers. By converting your online store into a Multi-Vendor Marketplace you can offer a wide variety of products to your customers that are also at competitive prices. The top eCommerce stores like Amazon, eBay, Etsy is the best example of the marketplace model. 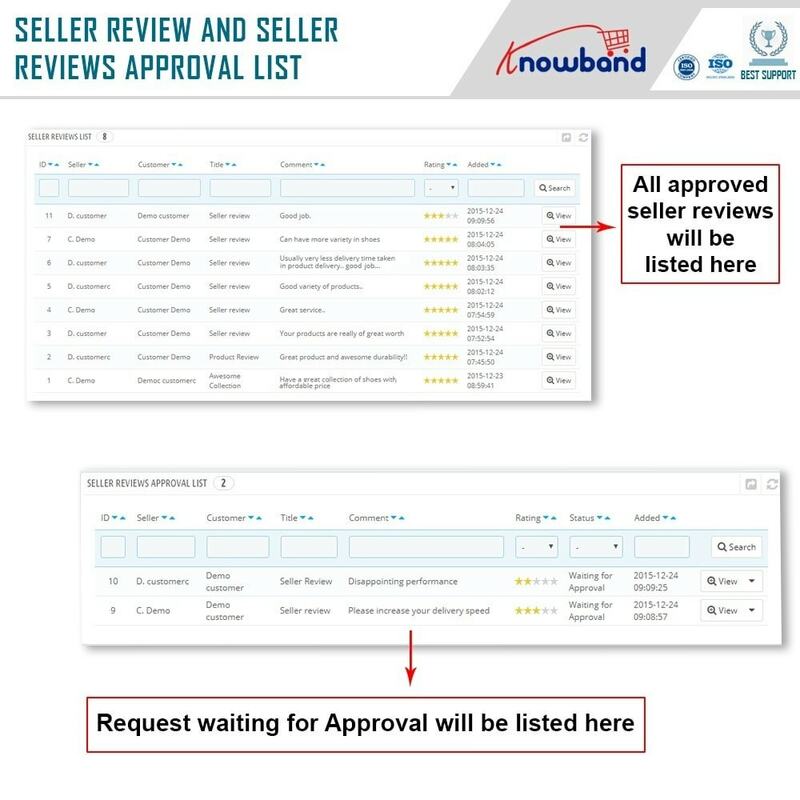 The Multi-Vendor Marketplace module developed by Knowband provides the full control to the store admin to manage the sellers, seller’s products, shipping methods, payment methods, review & testimonials, and customer feedback. 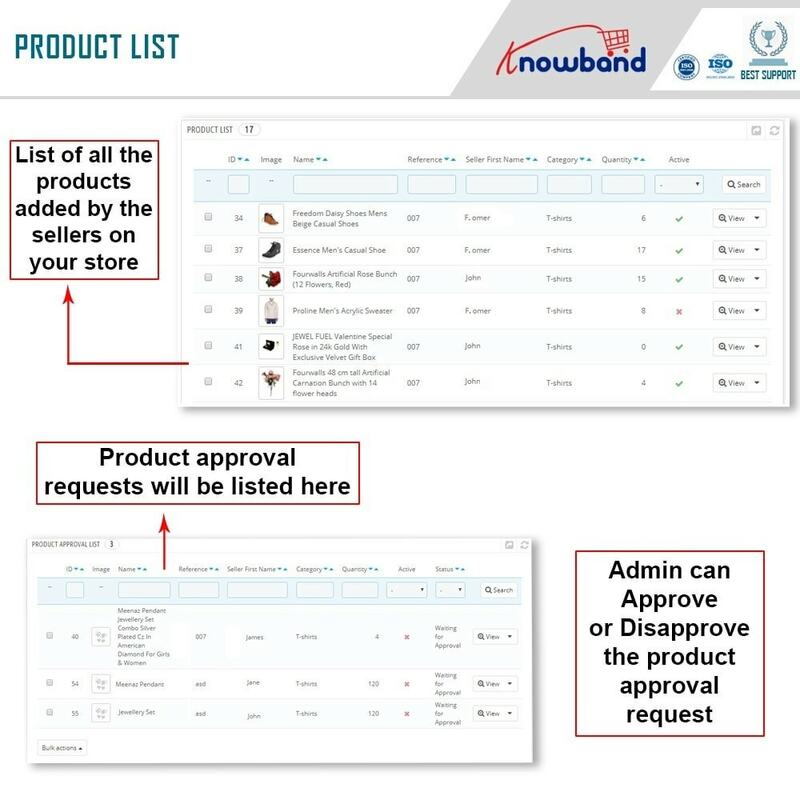 Knowband offers the best in class modules at very budget-friendly prices. 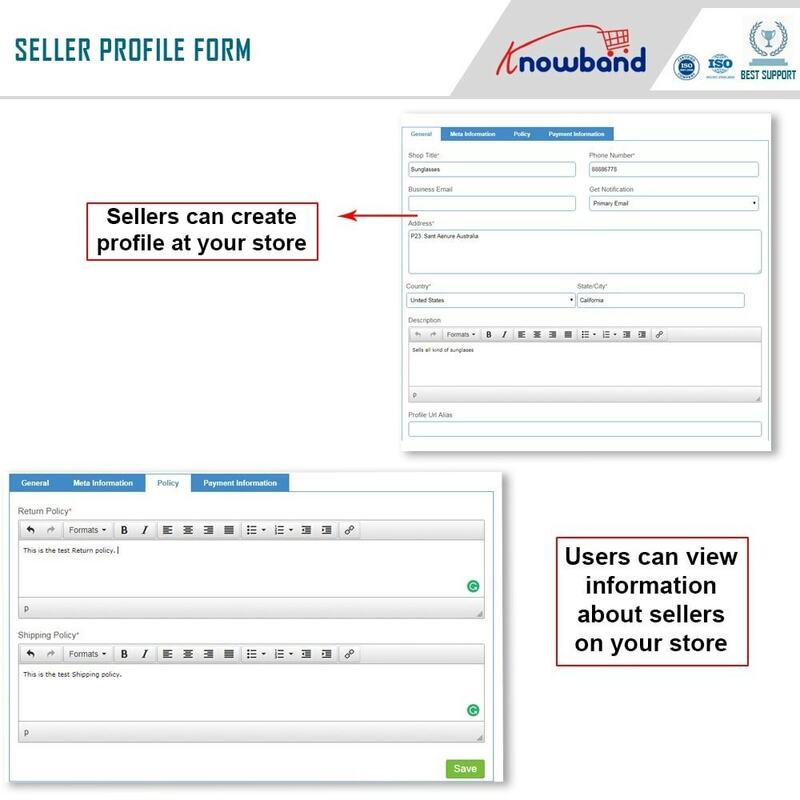 1) Allow multiple sellers to sell their products on your marketplace. 3) GDPR Compatibility - PrestaShop Marketplace module is GDPR compliant & allows the admin to meet the GDPR requirements to successfully run their businesses. 4) Commission Management - The store admin can set up the commission on the global or seller level. 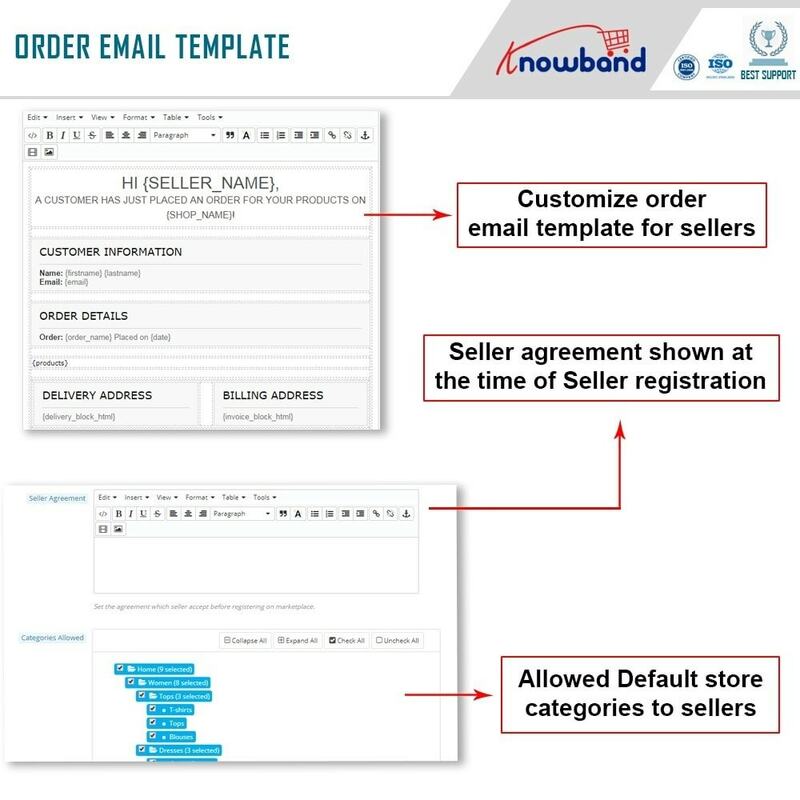 5) Email Notification: The Multi-Vendor Marketplace module offers readymade email templates for different events like seller registration, seller account approval, Product Approval, Review Notifications, Payout request notification and many more. *** These marketplace email templates allow the admin to manage the marketplace operation with ease. 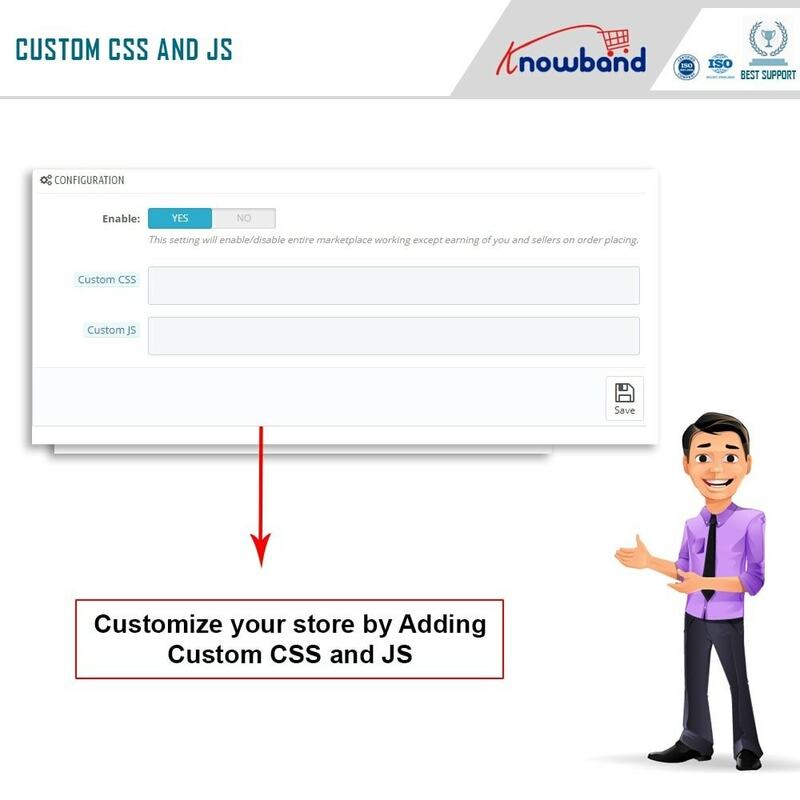 9) Convert your Marketplace into a mobile app (Android & iOS) by using the Mobile App Builder Module developed by Knowband. 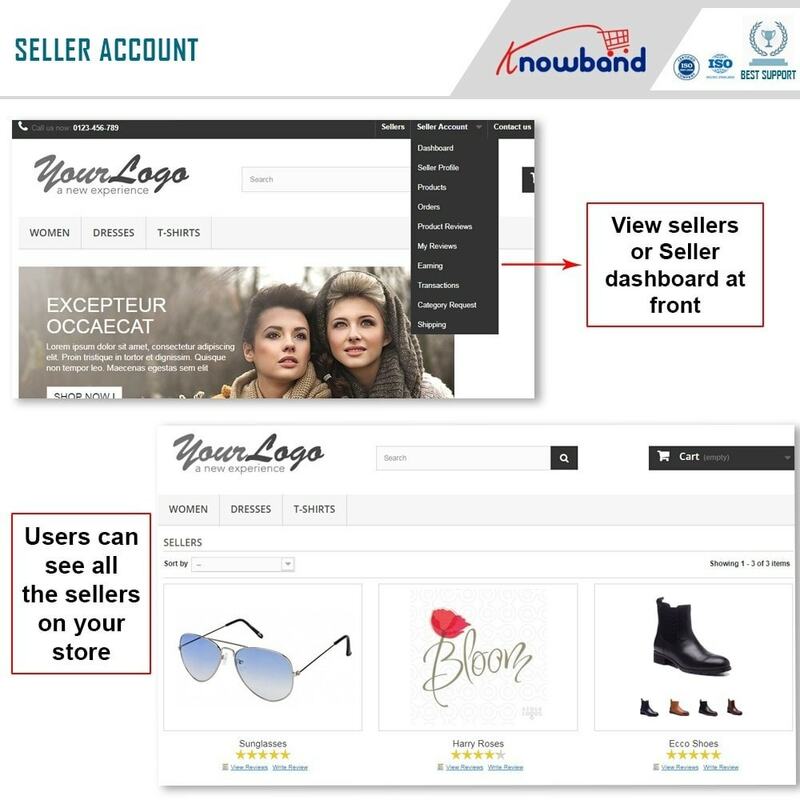 *** Mobile App Builder Module developed by Knowband is compatible with the only Multi-Vendor Marketplace module developed by Knowband. 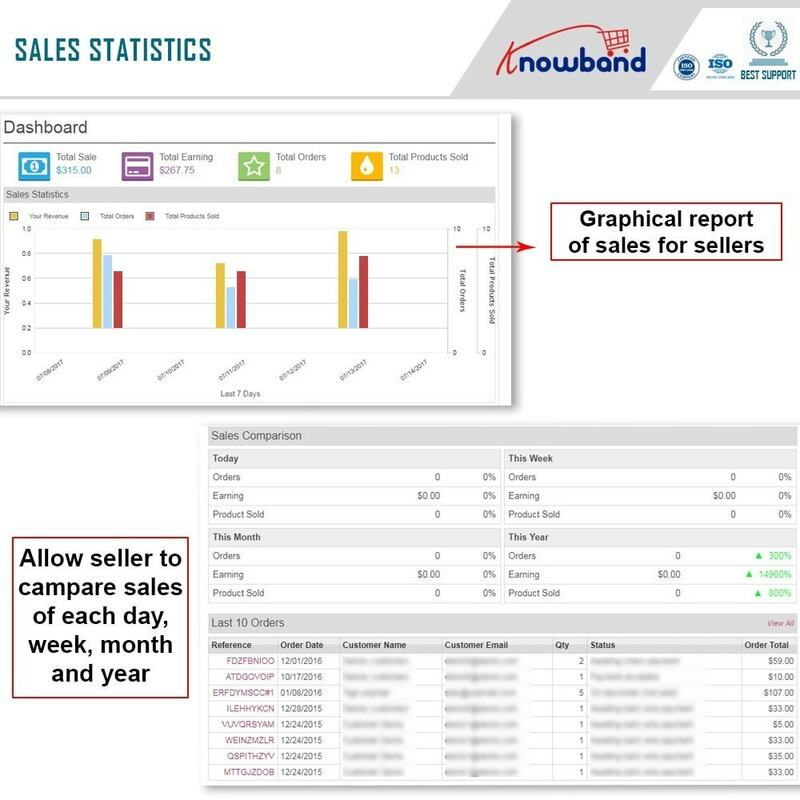 1) Dashboard: The seller can access the dashboard to see the sales overview generated from the marketplace. 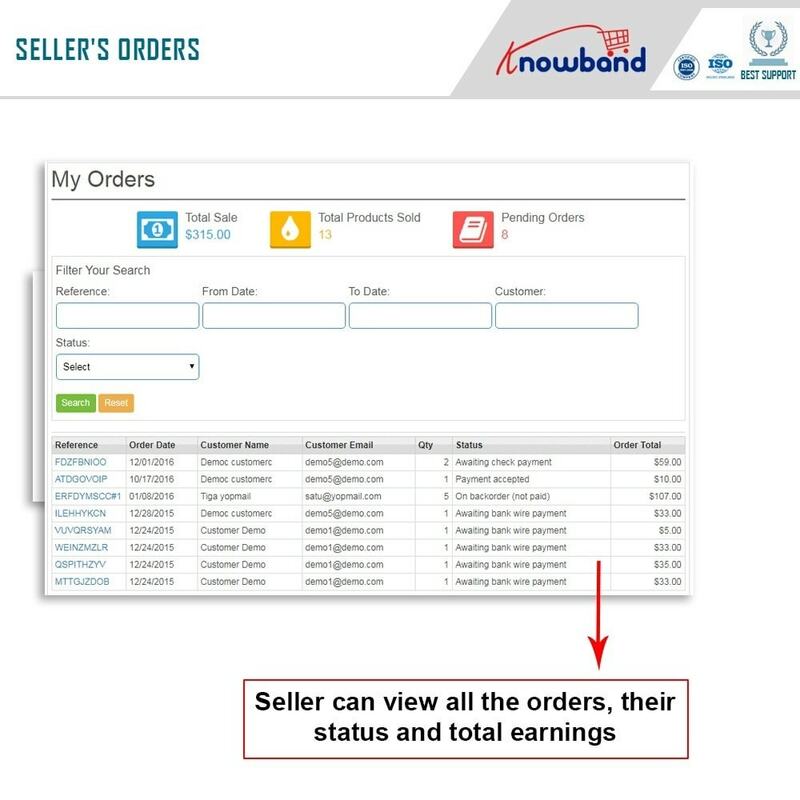 The sellers can view the total sales, total earning, total orders, total products sold. The seller can also view the sales comparison based on the Daily, Weekly, Monthly, and Yearly basis. Recent 10 orders can be viewed in the Dashboard. 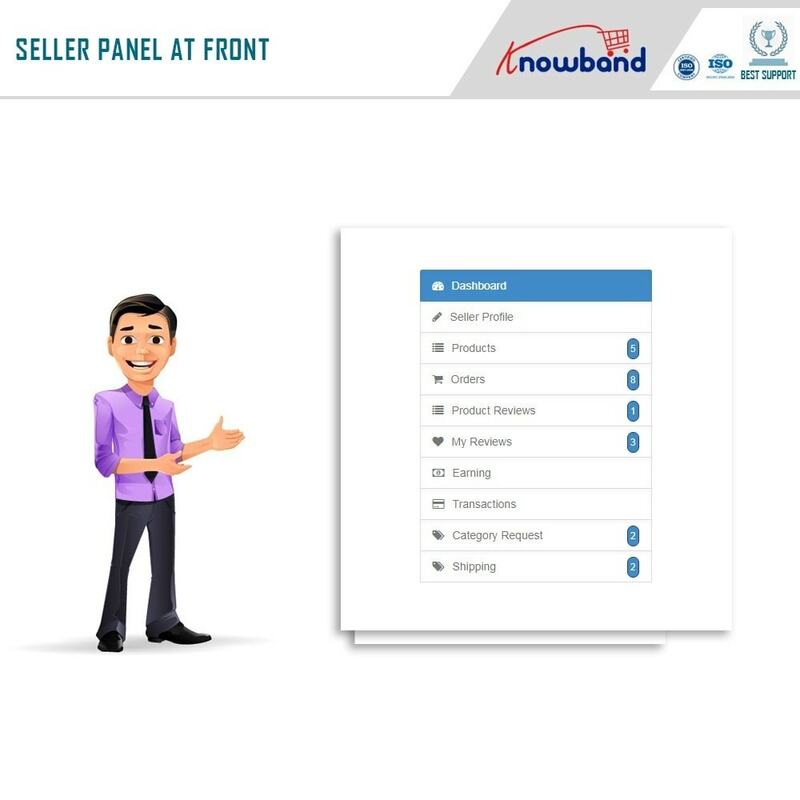 2) Seller Profile: The sellers can manage their profile on the marketplace from the Seller Profile section. The sellers can add the Social Links, Shop Banners, Shop Logo, SEO details for the shop, Policy for the Privacy, Return & Shipping. The sellers can also add Payout options to get the payments. 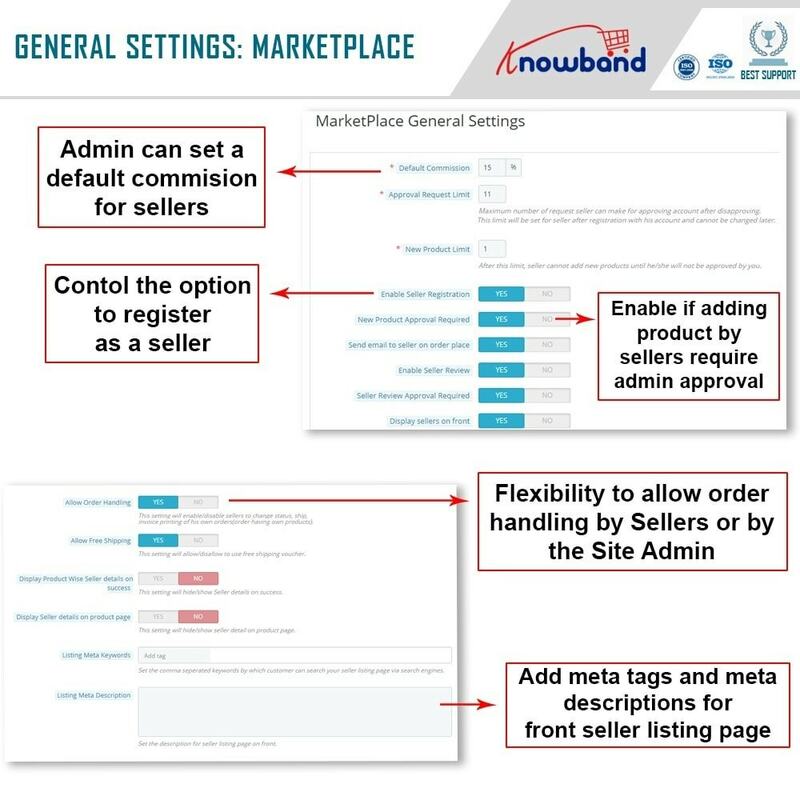 3) Products: The sellers can view their listed products and add new products from the products tab of the marketplace settings. 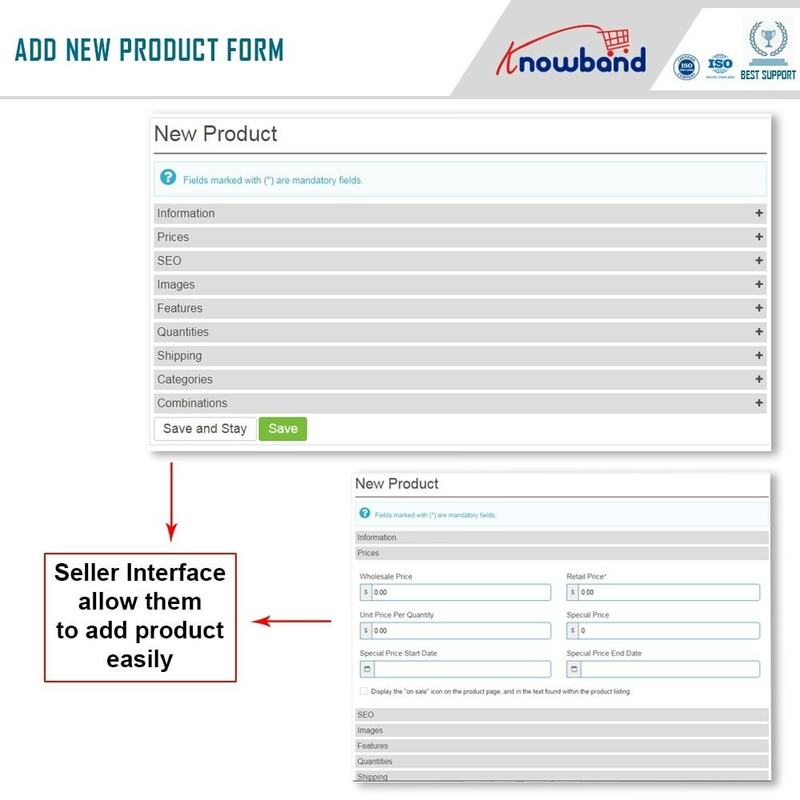 Product tab allows the sellers to add - Standard Product, Pack of Existing Products or Virtual products along with the basic information of the products like short descriptions, long description, images, pricing information, SEO (friendly URL, Meta title, meta description, quantity (with option to display message for out of stock products),Category, Shipping, Supplier and combination mapping. 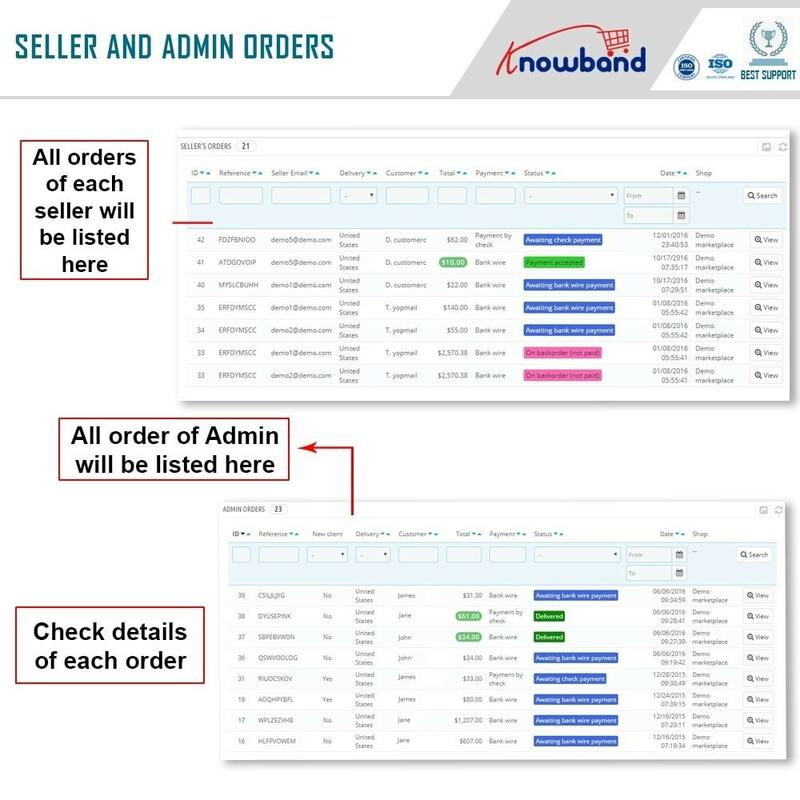 4) Orders: The sellers can access the order details from the orders section of the Marketplace settings. From here the store admin can update the order status as well. 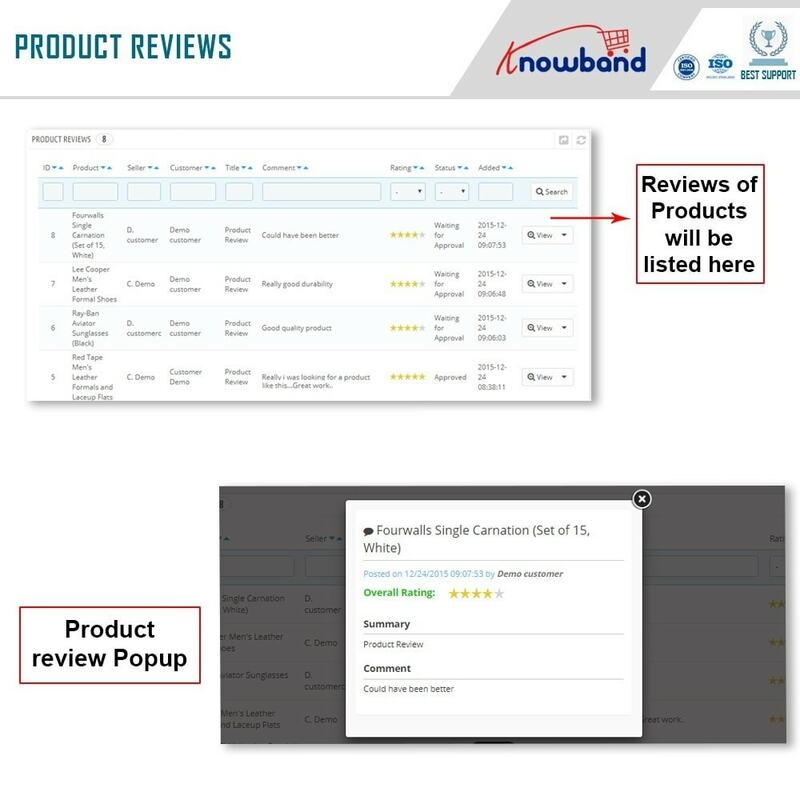 5) Product reviews: Reviews helps to increase product authenticity and works as a trust factor for new customers. 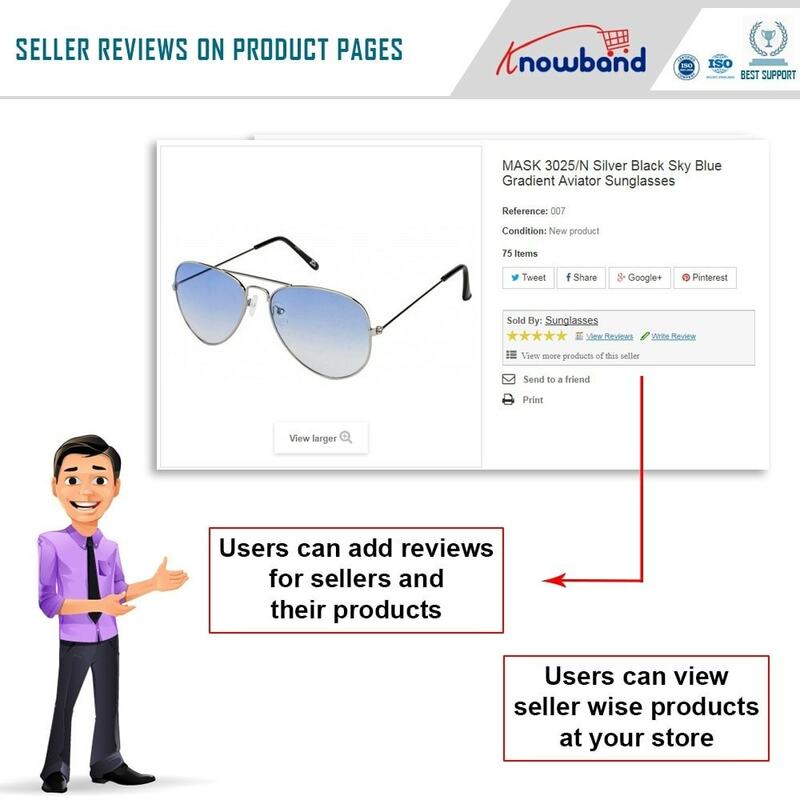 The sellers can manage the product reviews from the Product reviews section of the marketplace. 6) Store testimonials: The Marketplace module allows the customers to post the reviews for the sellers. These reviews can be managed from the Testimonial section of the marketplace settings. 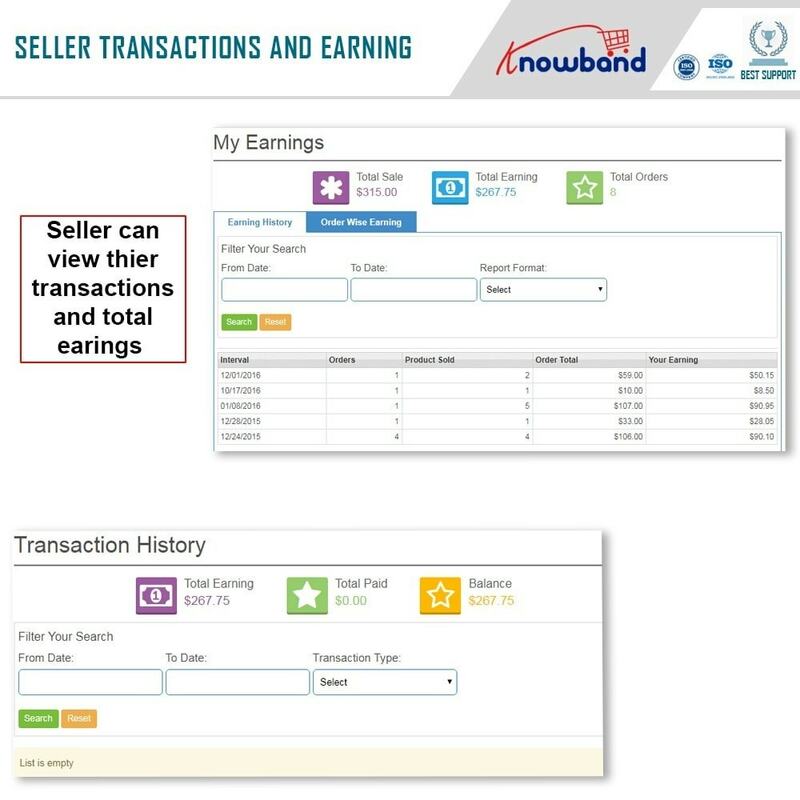 7) Earning: The sellers can view the earnings from the earning section. 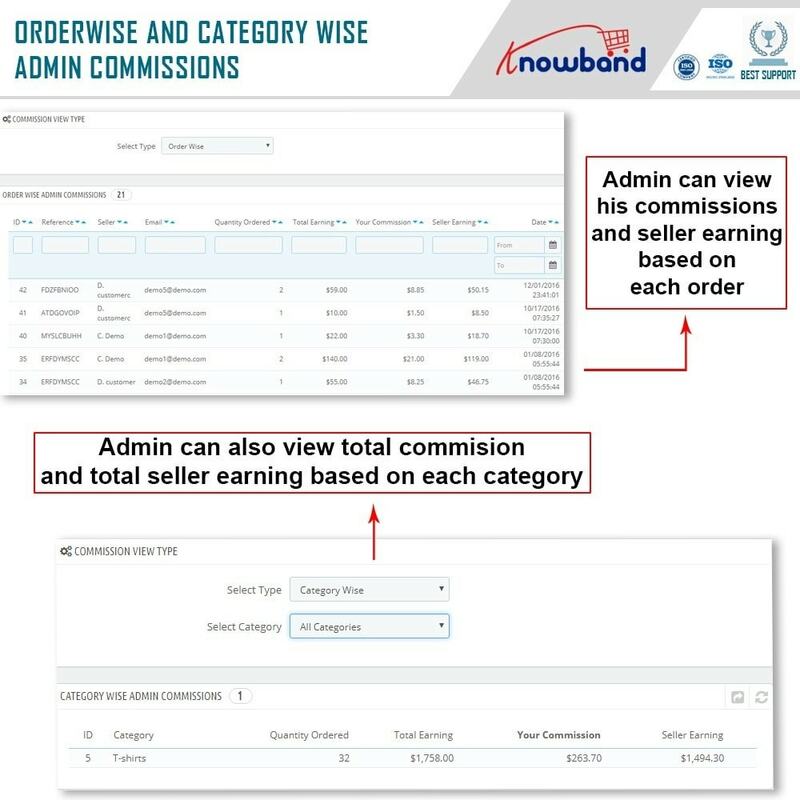 This section allows the sellers to view the earnings per order. 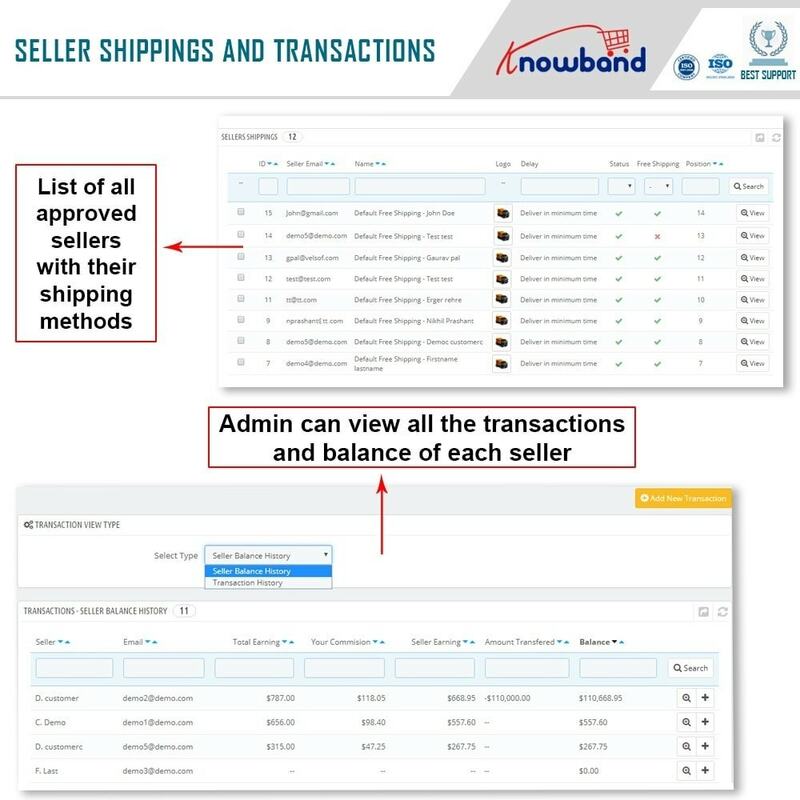 8) Transactions: The sellers can track the transactions made between the seller and marketplace admin from the Transactions tab of the marketplace settings. 9) Payout: The sellers can make a payment payout request from the Payout setting of the marketplace module. The status of the previous payout requests can also be viewed from the payout tab. 10) Category Request: The sellers can request new categories from this section of the marketplace module. 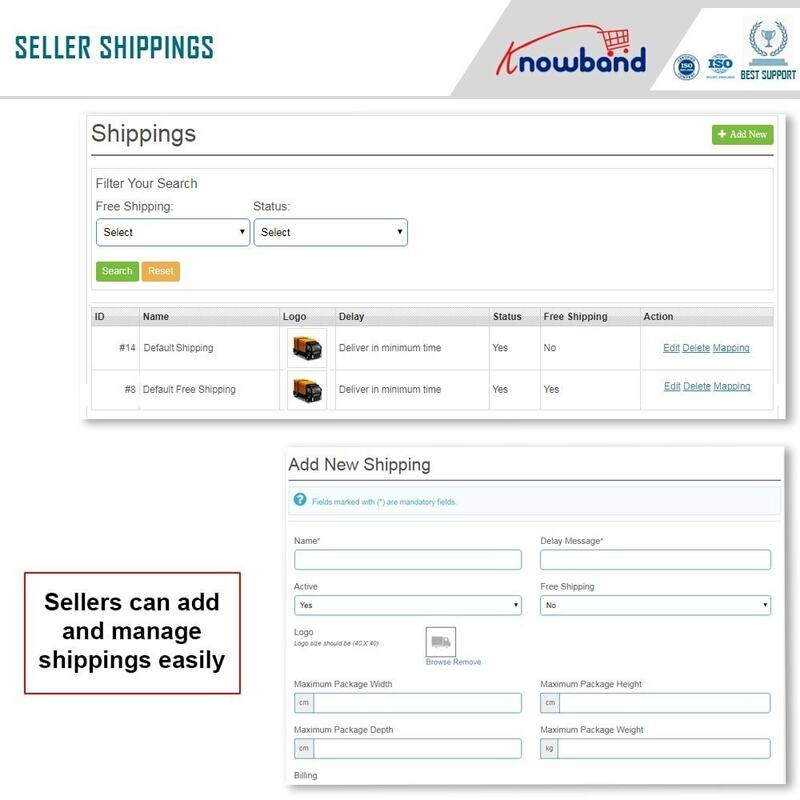 11) Shipping: The sellers can manage the shipping options for the marketplace products from the shipping tab. The sellers can add their own shipping methods to offer a better shipping service to the customers. 12) GDPR: GDPR tab of the marketplace allows the sellers to download the Product Listing, Orders, Personal Information, Seller Details, and Addresses. If required the seller can also request for the shop close. 1) Commission management: The store admin can set a global commission for the sellers. If required the store admin can update the commission for the individual sellers. 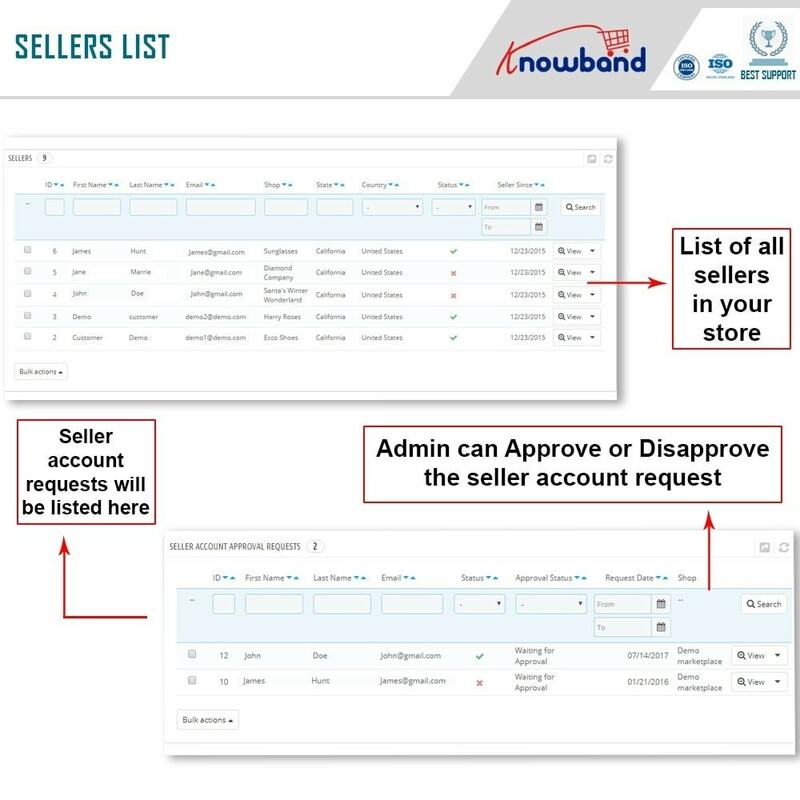 2) Seller Management: The admin can view and manage the seller registration request, seller commissions, seller orders, seller shipping methods, seller reviews etc. 3) Transactions: The admin can view the earnings and commission details from the transactions tab of the marketplace module. Admin can also make a transaction from this tab. 4) Transaction Payout requests: The sellers can make a payout request for the balance. These payout requests can be viewed from the Transaction payout request tab of the marketplace module. Admin can approve the Payout requests in a single button click which makes it easy for the admin to manage the marketplace operations. 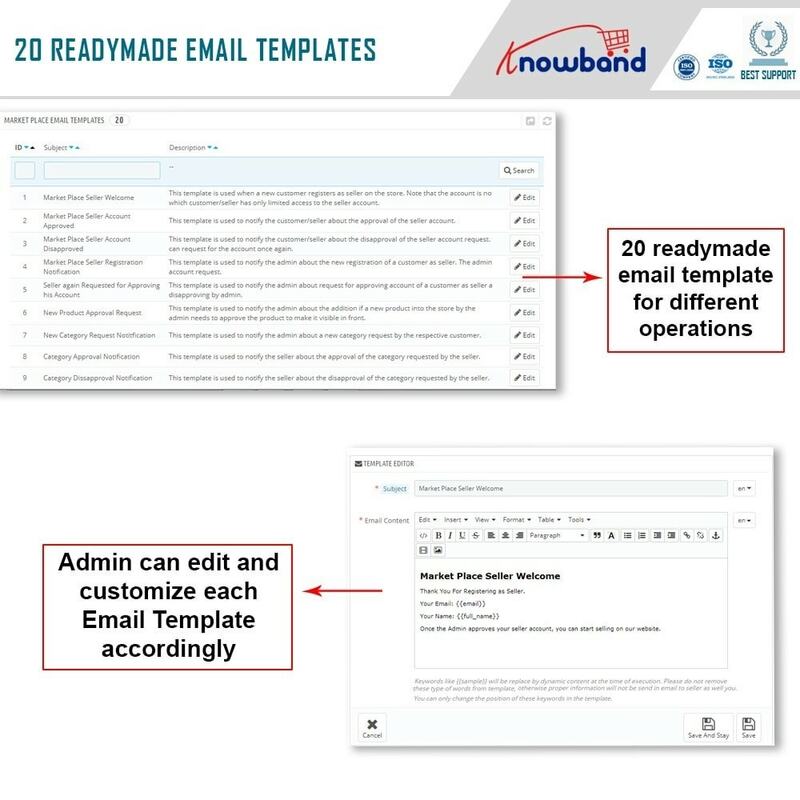 5) Email Templates: There are more than 30 pre-existing email templates for managing the entire marketplace communication between the sellers and admin, sellers & customers. The admin can view and modify the text of the email templates. 6) Admin orders: The store admin can view his own orders received from the marketplace from the Admin Orders tab of the marketplace module. 1) Customers will be able to access a variety of products from the different sellers at competitive prices which will improve the customer experience. 2) Customers can view the seller profile, privacy, shipping, and return policies offered by the sellers. 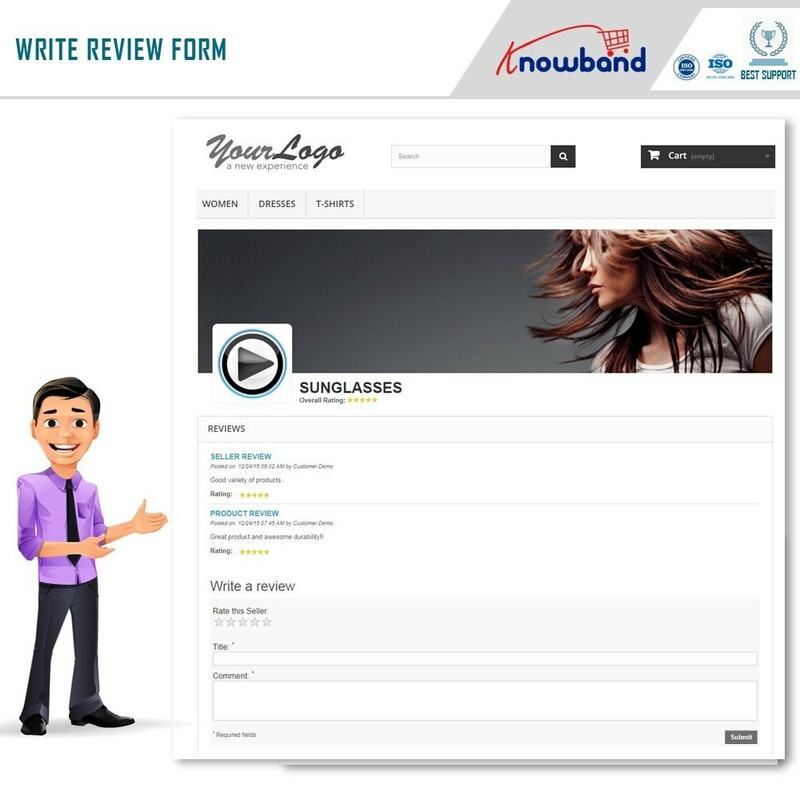 3) Customers can post reviews and view the reviews posted for the sellers. 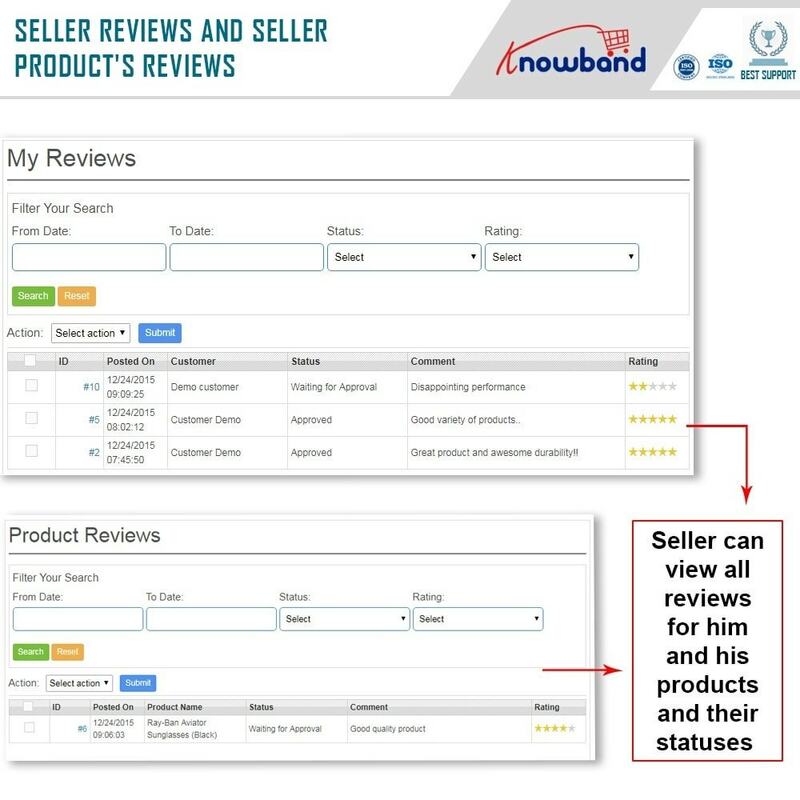 4) Customers can view all the products offered by a particular seller in the same place. Helpful and useful module to build marketplace based on PrestaShop! Flexible for modifications and customizations to suit client need to accomplish their goal. There are a bit problem with installation with the latest prestashop version 1.6, and the documentation provided maybe can not explain everythings. But the their support team was very very good, they answer and fix the problem quickly. Very recommended module for those who want to build an e-commerce marketplace site.Keep up the good work! Five stars support service, very knowledgeable and effective people. Total satisfaction with the module. Thank-you very much!